It's New York State Fair Time Again! It’s that time of the year again in Syracuse when hundreds of thousands of people will converge on the New York State Fairgrounds for the 2011 edition of The Great New York State Fair over the next 12 days. Here is my annual recap of past blog posts featuring the Fair. 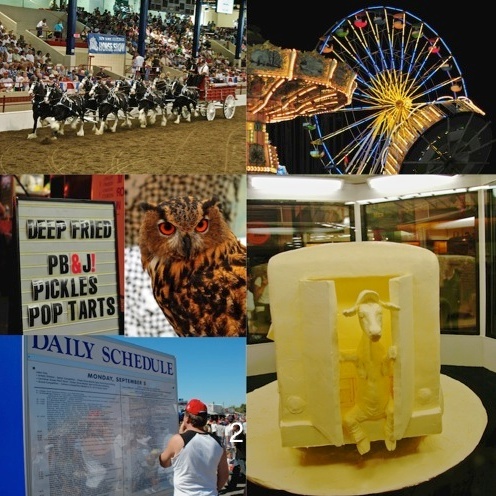 This entry was posted in Event and tagged central new york, collage, new york, New York State Fair, nysf, syracuse. Bookmark the permalink. That’s an old photo. They fry a lot more stuff these days like a whole stick of butter, Oreo cookies, Twinkies and even ice cream. Have something deep fried for me when you go! A deep fried Reese’s Peanut Butter Cup…. deep fried 3 Musketeers, or deep fried Milky Way! YUM! On the bottom right… is that carved out of butter??? Btw. fried ice-cream is nothing new, (some) Mexican restaurants have had that for years, and it’s soooo good! Yes, the butter sculpture is in the Dairy building every year. I took photos of it tonight. Can’t believe it is already fair time! The BigE isn’t too far away now and I’m sure the fry booth will be there. I imagine Irene will hamper things this weekend. Stay safe! We will get little of Irene over here in central NY. You, on the other hand, best be ready for power outages and damage. Yep, it’s Fair time! Enjoyed my first raspberry pie and ice cream last night, checked out the butter sculpture and photographed on the Midway.